Wear a Piece of My Art! 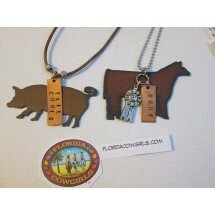 Handcrafted cowgirl necklace jewelry since 2008 by a Florida Cowgirl. Most pieces are one of a kind and unique. Wear a Piece of My Art! Large agate pendant, matte finish, grey in color, with white palm wood &a.. Wear a Piece of My Art! 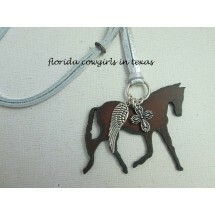 Black leather braided necklace with a pewter cross pendant tied on with a.. Wear a Piece of My Art! 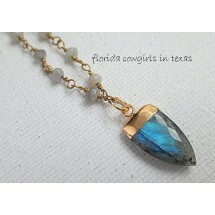 Small faceted labradorite pendant, brillant blue flash, 21mm, gold capped.. Wear a Piece of My Art! 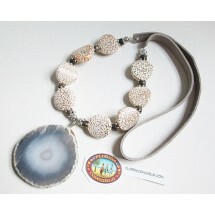 Grey faux leather handmade tassel with blue lace agate nugget accent bead.. Wear a Piece of My Art! 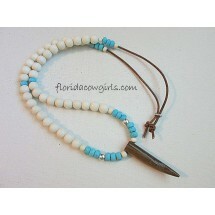 Brown bone pendant, with white wood & blue turquoise beads on leather.. Wear a Piece of My Art! Choose: #1 Black - Freshwater peacock black pearls on silver chain, ap.. Wear a Piece of My Art! 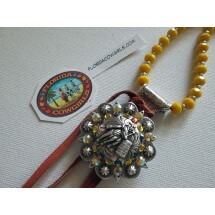 Barrel racer concho embellished with Swarovski crystals, strung with yell.. Wear a Piece of My Art! Black horsehair fan tassel paired with white faux glass pearl bead chain,.. Wear a Piece of My Art! 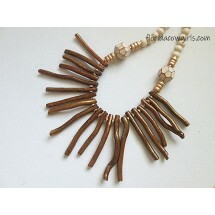 Gold painted coral stick beads, with natural & gold beads, .. Wear a Piece of My Art! 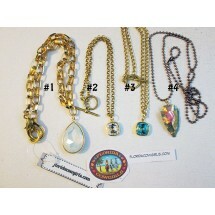 Choose: #1 White opaque Swarovski pear shaped crystal, with chunky gol.. Wear a Piece of My Art! 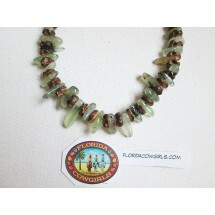 Choker style necklace, unisex styling, approx 15-16 inches long, prehnite.. Wear a Piece of My Art! Bringing back my guardian angel necklaces... Choose Rustic .. Wear a Piece of My Art! 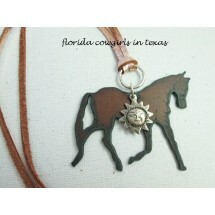 Bringing back my guardian angel horse necklaces... rust metal runnin.. Wear a Piece of My Art! 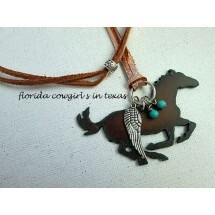 Bringing back my guardian angel horse necklaces... rust metal trotti..